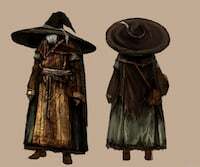 Big Hat Logan is a Character in Dark Souls. Once a royal member of Dragon School, he is now a scholar of the soul arts. He turned Undead over a hundred years ago, and has been roaming Lordran, searching for more wisdom, ever since. He is first encountered in Sen's Fortress, trapped inside a hanging cage in a blocked off area, and will teach relatively advanced magic after being rescued. He had a traveling companion in Griggs of Vinheim, but became separated from his company upon entering Lordran. Griggs mentions that Logan did this "For his safety...". To reach him you will have to rotate the "boulder machine," so the boulder crushes a wall behind a sleeping guard or wake up the sleeping guard and force him to attack the wall; it can break it with its Estoc attack. You can use the Cage Key or the Master Key to open the cage. The Cage Key is found at the top of the castle. Jump across the broken walkway that leads to a lone tower, then descend the stairs. Kill the guard and pick up the key. It is not necessary to have freed Griggs of Vinheim. Logan will teach you various advanced magic spells, but only if your intelligence stat is 15 or higher. The Archive Tower Giant Cell Key which opens his prison can be found in a chest in the room with the collapsible staircase on the bottom level of the main building (the room before the crystal golem garden that leads to Crystal Cave). Either after you have rescued him from his cell or after you have defeated Seath the Scaleless, you can find him behind the shortcut bookcase that you opened to gain access to the crystal golem garden. Pass through it and he is on a small alcove in the left of the library. At this point he will sell you crystal variants of the original spells along with the originals. You can also talk to him for hints on how to defeat Seath the Scaleless. Note that you MUST buy all of his spells or he will not become insane. After you buy all of his spells and defeat Seath the Scaleless, Logan will not recognize you and tell you not to bother him, which leads to triggering his final appearance. Talk to him several times, and you'll notice that he's clearly gone mad. Now rezone / reload again (may take two reloads) and he'll have left that spot. 4. Final: Original room from Seath the Scaleless. ‍His final appearance is in the original room where you first encountered Seath. Logan has gone insane and starts attacking you with his spells. You will have to resort to killing him. For this you will get his drops. After you kill him, go back to the room where he sold you his spells. You will find a chest in his place with Logan's Catalyst, as well as the remainder of the Big Hat's Set. Note: You will need to reload the game before each of these events if you have not done so since defeating Seath the Scaleless. Dudes, ive done every single part twice until the last part where he goes insane in seath&apos;s, i have the remastered ps4 edition, he Just wont appear there, i dont know what else to do. During my first playthrough of dark souls, I was told to kill logan as soon as I freed him, because he would kill people in firelink. Is that true? I love Dark Souls&apos;s lore. It&apos;s so mysterious and open to interpretation/ theorycrafting. For example: Why is his name Big Hat Logan? No one knows for sure. Do you have to wait to beat seath? Or can you kill seath the scaless then buy the remainder of Logan&apos;s spells to complete big hat Logan&apos;s quest line? Went through all the steps to turn Logan mad, and he didn&apos;t drop his hat or the TCC. We did get the spell (White Dragon Breath) and a humanity, and even went and got the rest of his set in the chest along with Logan&apos;s catalyst. Does anyone know if this is a drop with a high drop rate and we just got super unlucky, or is there something we can do to get them still? For anyone in dsr if you are having trouble making Logan leave firelink after placing the lordvessel what worked for me was going up the shortcut lift then stepping out to undead parish then walking back on the lift and return to firelink, this worked for me after talking to Logan several times, talking to Griggs, reloading the game several times, warping to other places, and killing two bosses didn&apos;t.
How do I unlock the crystal spells? Thx in advance. The complete hollowing of characters like these always saddens my heart. Can conform that Logan leaves Firelink Shrine after water is drained from New Londo Ruins. Which will let you buy an additional Soul Spear and Homing Soulmass spell from Griggs. I read that some actions can make that a character doesn&apos;t go mad and because of that, they keep being alive for a long time (even until Dark Souls 3 in some cases). Andre is our blacksmith, that&apos;s his duty, Patches tricks us to steal our things, Logan sells spells. Without that, their existence is hollow. Our duty is to relink the Fire, we can&apos;t go hollow because we keep trying to reach it. When he appears in dukes archives i still need the 15 inteligence to buy the spells? When he appears in dukes archives i still need 15 inteligence to buy the spells? I&apos;d like to share here a tip that might help Sorcery builds aiming at being members of the Darkwraith covenant in NG: you cannot place the Lordvessel on Firelink Altar (to keep Kaathe available), but you CAN make Logan leave Firelink Shrine, thus allowing Griggs to sell you additional units of the Soul Spear and Homing Soulmass spells (which may be helpful against Sif and Four Kings). I don&apos;t know the exact trigger, but here&apos;s the steps I took (I&apos;m playing PTDE on PC): 1 - Freed Griggs (Lower Undead Burg) 2 - Bought all spells and rings from Griggs (Firelink Shrine) 3 - Rang both Bells of Awakening (Undead Parish / Quelaag&apos;s Domain) 4 - Freed Logan the 1st time (Sen&apos;s Fortress) 5 - Bought all spells from Logan (Firelink Shrine) 6 - Did a lot of stuff unrelated (I think) to Griggs/Logan: killed Moonlight Butterfly, Hydra (Darkroot Basin), Havel, Pinwheel, Capra Demon, Gaping Dragon and Ceaseless Discharge, cleared Great Hollow and Ash Lake (killed the 2nd Hydra), entered Chaos Servant and Forest Hunter covenants, bought all Pyromancies from Eingyi, Laurentius and Quelana 7 - Got Lordvessel (Anor Londo) 8 - Talked with Logan (Firelink Shrine), he has a different dialogue when ending the conversation 9 - Got Key to the Seal by talking to Ingward (New Londo Ruins)10 - Opened New Londo flood gates 11 - Killed both Mass of Souls (New Londo Ruins)12 - Griggs is now alone again at Firelink Shrine Sorry for the lengthy post, I hope it may be useful.Many thanks to the site owners and contributors, the guides and forums here are really helpful.